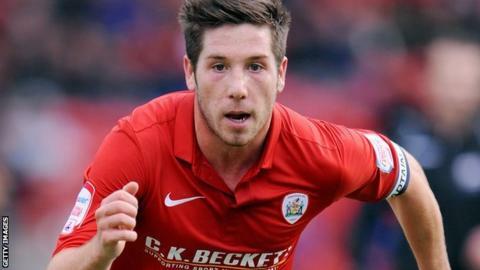 Norwich City have reached agreement with Barnsley over the amount of compensation they will pay for new signing Jacob Butterfield. Butterfield agreed a four-year contract with the Canaries earlier this month but the Yorkshire club were entitled to compensation because he is only 22. Manager Keith Hill described Norwich's initial offer as "scandalous". But a statement on the Barnsley website said: "The club are now happy to have accepted a vastly improved offer." The agreement means the matter will no longer have to be referred to a tribunal. Butterfield is currently working to regain full fitness after suffering a serious knee injury last December that meant he played no further part in the 2011-12 season. And new team-mate Jonny Howson has backed him to make an impact at Carrow Road, having made the same step up from the Championship last term, as well as increasing competition for places in midfield. "It's obviously tough when you come to a new club and you are injured because you want to make an impression. I'm sure Jacob will be the same," Howson told BBC Radio Norfolk. "I played against him last season when he was at Barnsley and I was at Leeds and he's a terrific player. "You want competition for places - it keeps everyone on their toes. "If you can get that in every position, no-one can relax. If you are in the side, you've got someone on your shoulder wanting to get in the side, and if you're not in the side, you're wanting to get in the side."